There are two kinds of people: people who eat peanut butter directly out of the jar at the people who do not. I am in the former group, and so are my kids (they ask for “peanut butter spoons”). I am not very discriminating–I’ll eat all kinds of nut butter directly from the jar. For the record, I generally eat nut butters on bread. The quality and cost of nut butters vary. This past week, I tried sunflower seed butter for the first time. 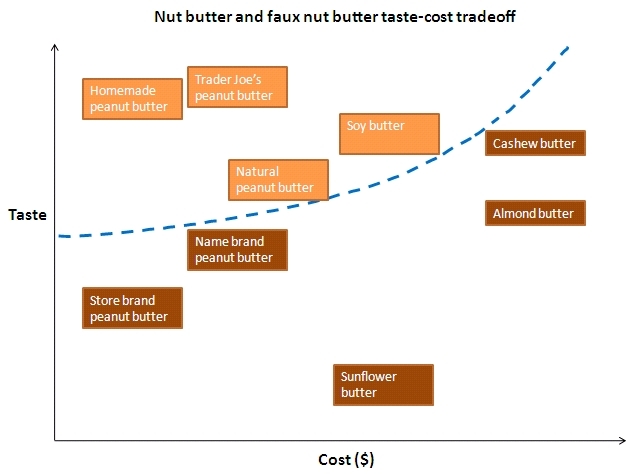 It inspired me to make a figure capturing the taste-cost tradeoff in various nut butters, which is displayed below. My favorite nut butter is Trader Joe’s peanut butter made from unblanched peanuts. I like my homemade peanut butter (see recipe below) and soy butter almost as much. Natural peanut butter (made by various companies) are also pretty good and frugal. Cashew butter is fantastic but expensive. I like almond butter and sunflower seed butter, but I’m not in love with them. I ended up with four types of nut butters that are tasty enough to justify buying them (see the figure below). Recipe: When I make peanut butter, I follow the following recipe. I put the peanuts from a 12 oz. can of peanuts and salt to taste in my KitchenAid food processor. I process the peanuts along with safflower oil as needed until I end up with peanut butter of the desired consistency. I also make cashew butter using this recipe, except that I replaced the peanuts with cashews (of course!). Almond butter is not as easy to make at home. What are your favorite nut butters? The nut butter taste-cost tradeoff. The dotted line separates the tasty, frugal nut butters (in orange) from the nut butters that are not tasty enough to warrant their cost (in brown). This entry was posted on Wednesday, August 17th, 2011 at 10:15 am	and posted in Uncategorized. You can follow any responses to this entry through the RSS 2.0 feed. Surely cost should include health effects. If one butter type has twice the calories should that increase its cost to us? Assuming like most people nowadays we have the historically unusual problem of too easy access to calories. What would a modern Stigler diet problem look like? As well as the old nutritional constraints you would also want to keep the calories below a certain level. 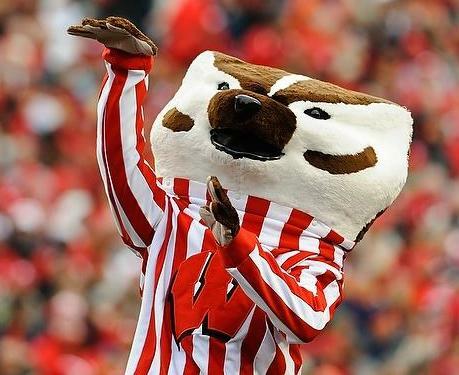 Luke, I wasn’t all savvy when making the curve. Looking at the figure, nut butters like sunflower seed butter are clearly dominated when considering the Pareto front. Actually, homemade peanut butter and Trader Joe’s peanut butter dominate all of the other options. Ultimately, I don’t want to eat just one type of nut butter – I’d like a few choices. I eyeballed what would be good choices when considering tradeoffs between my two criteria. The orange nut butters are those that would be “acceptable” choices when considering cost and taste. I’ve had trouble finding soy butter lately with the school year starting up. It was hard not having to go without soy butter for awhile. 1) The advantage of sunflower butter is that it’s allowed in schools and camps that have strict ‘no-nut’ policies. 2) The taste differences become less significant once you use the spread in a sandwich with fruit or jam. Excellent points, Greg. The soy butter I buy specifically has a label on it that advertises how it’s safe at schools. Sunflower seed butter *does* taste like natural peanut butter once it has jam on it. The difference is pretty noticeable if you eat it directly from the jar (my daughter didn’t like her sunflower seed butter spoon last night). I think it’s pretty good, but it has a taste. In what alternate universe is cashew butter equivalent or slightly lower than soy butter on the taste axis? I love almond butter and I actually prefer it to peanut butter. I don’t buy it as often because, as you point out, it’s very expensive. So I typically stick to organic unsweetened unsalted peanut butter. At Whole Foods sometimes they have this industrial grinding machine with raw almonds in it that you can use to create almond butter on the spot. Why doesn’t your recipe work for almonds too? Bork, this scale is completely subjective. Both cashew butter and soy butter are great, and although I prefer soy by just a little, I definitely couldn’t go without cashew butter. (My kids prefer soy butter, too). Tallys, the recipe sorta works for almonds, too. Almonds are so much harder than I cannot get a smooth paste at home, even on my commercial strength KitchenAid food processor. I think the homemade stuff tastes better than the store bought almond butter, even if it is very crunchy. @siah, choosing chocolate nut butters is cheating 😉 In full disclosure, I bought a jar of dark chocolate peanut butter this week. It’s my ultimate comfort food. Nutella may be a lot of things, but not a “hazelnut butter” – its basically sugar and vegetable oils …with traces of hazelnut. Laura, where do you get dark choc. peanut butter? That sounds like one of the essential food groups all by itself.